This past July, 43 percent of school districts surveyed by the Government Accountability Office (GAO), serving 35 million students, tested for lead. Of those, 37 percent found elevated levels and reduced or eliminated exposure. 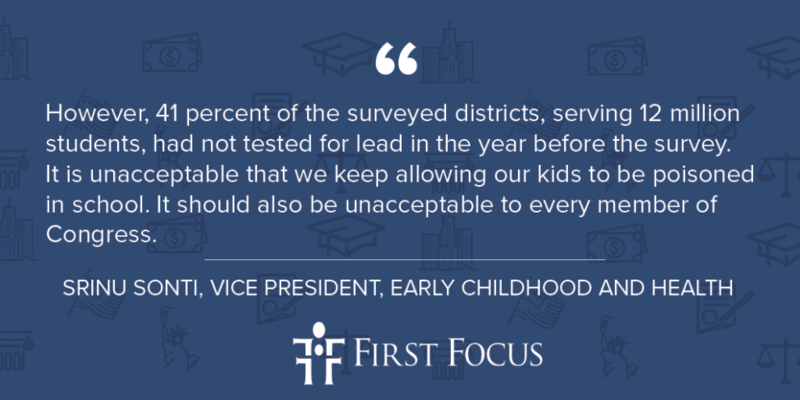 However, 41 percent of the surveyed districts, serving 12 million students, had not tested for lead in the year before the survey. It is unacceptable that we keep allowing our kids to be poisoned in school. It should also be unacceptable to every member of Congress. According to the Centers for Disease Control (CDC), even low levels of lead in blood have been shown to affect IQ, ability to pay attention, and academic achievement. And effects of lead exposure cannot be corrected. Marc Edwards, professor of civil and environmental engineering at Virginia Tech, who is nationally known for his work in exposing the tragic effects of the Flint Michigan water crisis, has advocated for greater federal intervention. Earlier this year EPA awarded his team a $1.9 million grant to study other American cities where lead-tainted water is suspected, but where residents are struggling to get help. While this grant should be lauded, states, local education agencies, and the EPA need to start collaborating closely on this issue to make informed decisions to protect our children. In 2005, the Department of Education and the EPA agreed to a series of specific steps to address the crisis, but they have not made satisfactory progress even after the Flint crisis. The EPA updated its 1994 guidance named, “Lead in Drinking Water in Schools and Non-Residential Buildings”; updated the 1994 guidance named “Sampling for Lead in Drinking Water in Nursery Schools and Day Care Facilities”; and created guidance for the implementation of the Lead and Copper Rule for schools and child care facilities that are regulated as public water systems under the Safe Drinking Water Act. EPA also provided tools and guidance on lead in drinking water in schools and child care facilities. The Department of Education agreed to work with water agencies and the CDC to help schools reduce the amount of lead. Given the amount of time between the 1994 EPA guidance, the 2005 understanding between the Department of Education and EPA, the Flint water crisis, the continuing high levels of lead in many or our nation’s schools, and now the 2018 GAO study, it is high time for Congress to pass an infrastructure bill that will help schools remove lead from their water. First Focus is committed to working with Congress to create a stronger Federal response to this continuing problem, but now is the time to act.